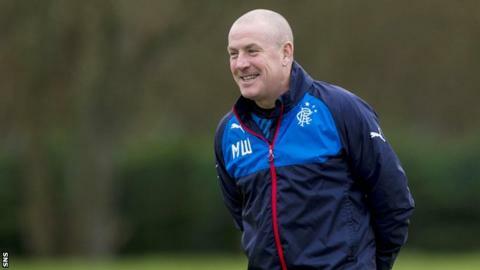 Rangers manager Mark Warburton denies his side are enduring a slump in form, and said their recent goal-scoring record is down to tougher defences. And the Ibrox boss is amazed the word "crisis" is being used in the media. "We've played 14, drawn one, lost one - if that's a crisis then there's a crisis in football," said Warburton. "At the start teams saw how we play, it's quite natural then to put eight, nine, 10 men behind the ball - teams will do what they have to do to win." He added: "That's not a criticism, but we have to deal with it and it's tough to break down compact, solid defences of that number of men." Despite winning their first 10 Scottish Championship matches, their run was broken by Hibernian at the start of this month when they lost 2-1 at Easter Road. But Warburton played down accusations that their goal-scoring has dried up, and pointed to their goal difference of 31 after 14 games, which he said speaks volumes about the potency of his squad. "Other teams have gone on a very, very good run of form and teams who dropped points at the start of the season have put a run together," he said. "All credit to them as it's hard to put a run together at any time in football. So I don't think it's Rangers' form dipping, it's other teams improving. "If we are 10, 11 or 12 points clear and we lose three games of football, while the other teams win their games, then I would agree (there is a crisis). Rangers currently sit level with Hibernian on points at the Championship summit, topping the table on goal difference, but have a game in hand over the Edinburgh outfit. The two meet next at Ibrox on 28 December and, while it is on his radar, Warburton said they will not take their eye off the ball in preparation for that clash. "I think it's dangerous to do that, and that's the natural outlook I understand that perfectly and everyone will be saying all eyes are on the 28th, but I think we've got to look at the fact that that's a banana skin - you've got to watch games in between. "There's no point focussing on the game four or five weeks ahead if you drop points in the meantime." Striker Martyn Waghorn, meanwhile, who has scored 17 goals in Rangers' 14 league fixtures, is not worried about finding the net. "We've not been as clinical in front of goal or not scored as many goals as we could have, but that's down to other teams sitting in more defensively, holding their shape and making it difficult for us," he said. "But we've only lost one game and everyone is saying we're going through a slump - that's crazy, but something we've got to deal with. "It gives us a challenge on a Saturday, how to break teams down and find different ways to score." Waghorn believes the current pressure is simply part and parcel of playing for Rangers; he too welcomes the competition at the top of the Championship. "Hibs are level with us now and it's going to be a challenge to see if they can keep up so let's see how it pans out the next weeks," he added.